Wheel Of Fortune may be, well, Wheel Of Fortune, but that doesn’t mean it’s incapable of creating moments of pure, heart-stopping drama. Who doesn’t love the fickleness of the wheel, the occasionally infuriating contestants, and the random puzzle that you can’t solve so they just drive you crazy? Everyone remembers where they were when they first saw “the most amazing solve” in history and the guy who got “Port & Starboard” with only one letter, and now we may have a new entry in the collection of great Wheel moments. That’s because—for the first time in over a decade—today’s Wheel episode ended in a tie. 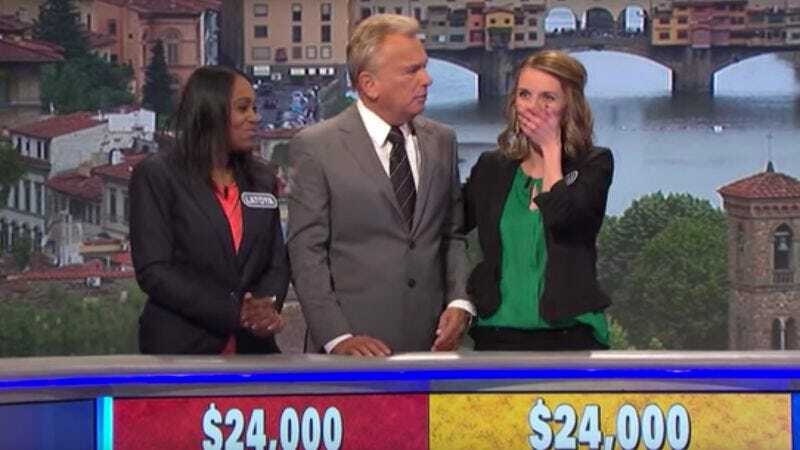 Contestant Danielle Gilseth won $24,000 on the final puzzle, correctly guessing “Hollandaise Sauce,” but fellow contestant LaToya Williams also finished out the final round with $24,000. A tie like that hasn’t happened since March of 2006, but host Pat Sajak very quickly got things under control and explained that the tie would be broken by a “toss-up playoff.” From that point, time practically stopped. Danielle and LaToya grabbed the buzzers, held their breath, and waited for the next puzzle to appear before them. Then, thinking faster than an especially intelligent cheetah, LaToya searched her mental dictionary and came up with “Computer Programmer,” winning the playoff and going into the bonus round. The whole thing lasted about three seconds, making it all a little less dramatic than it should’ve been, but the fact that this hasn’t happened in 10 years is still pretty cool. You can see a clip of the tiebreaker below.